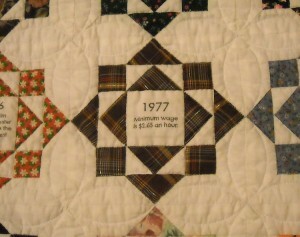 Do you remember back in 1999 when every quilter you knew was busy making a millennium quilt? Perhaps you were one of them? Well, I was one of those quilters. I had a grand idea for my millennium quilt, and as usual, I went all gung-ho at first, then it joined my other UFOs as life got in my way. Wanting to combine the past with the present, the old with the new, in a nod to the passing of a century and the beginning of a new one, I completely hand pieced my quilt top. And I wanted to hand quilt it as well, so it languished in the unquilted tops pile . . . for 12 years! When I sponsored my Final Countdown tasks for 2012 a few weeks ago, the first assigned task was to find your oldest UFO and do something about it. I’m not completely sure this is my oldest UFO, but it’s one of the oldest, and given that I had just moved, I was lucky to have even found this one, so it’s the one I chose to “do something about”. I loaded it on the longarm and machine quilted it. I figured that was mixing the old with the new in yet another way — hand piecing, machine quilting . . . and that meant I’d have it done a lot sooner. Who knows how long it might have laid there waiting for me to hand quilt it — another millennium? 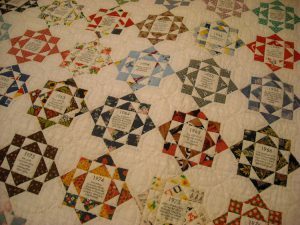 One hundred 6″ hand pieced quilt blocks, one for each year of the century, and in the center of each one is a trivia fact that happened in that year. If nothing else, it’s a good read, and very fun to look at! I sorta tried to match the fabrics for the decades to fabrics that quilters may have had in their stashes during said decade but I didn’t get real obsessed with doing that, because I’m not an expert at fabric dating, so I just went with what I thought some of them would be (like 1930s reproduction fabrics for the 1930s row), and others from what I could remember. For example, I do know for a fact that I had a shirt made from this brown plaid in 1977! This block’s trivia fact says: Minimum wage is $2.65 an hour. I inked the lettering onto the center patch of each block with a permanent fabric marker. I set the blocks 10 across and 10 down and surrounded them with a 6″ plain border. I can’t get it to show up real clearly, but I quilted the title of the quilt into the top border. Here’s a shot of the back side, which is also not real clear. I outlined each patch of each block, then quilted “petals” in between them. I did diagonal lines spaced 1″ apart in the borders. I bound it with the same plain white. The finished quilt measures 72″ x 72″. 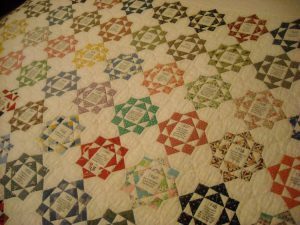 I suppose you all have had your millennium quilts finished since the year 2000? 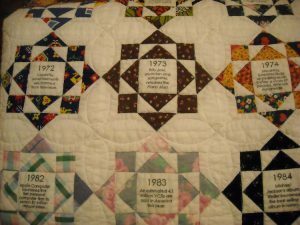 Am I the last quilter to finally finish my millennium quilt? That is a COOL quilt! It is a real treasure. Wow Shelly just Wow!!!! 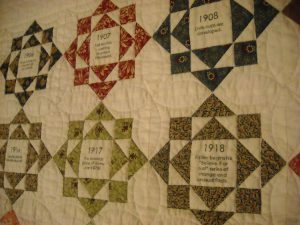 The idea of a millennium quilt is cool to begin with, and I love your version. The block design, selection of fabrics appropriate to the year, and message in the center is very clever. Can’t believe you hand pieced all 100 of these blocks! Congratulations on your finish! I love this quilt!!! What a perfect idea for a millennium qilt. Beautifully done! This is the best millennium quilt I’ve seen. I missed out on this craze as I was knitting at the time. 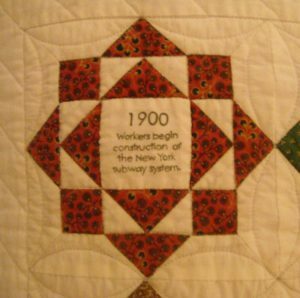 I saw this quilt while it was in progress back in 1999. 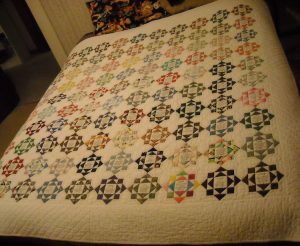 I finished my Millenium quilt from a Linda Brannock simple applique pattern and gave it to my husband because it was dark and homespun. It is all worn out. I don’t care. I love him more than I loved that quilt and now he has a flannel rag quilt with some hearts on it. He’ll have it worn out before long. WOW! Shelly, I am so impressed – this quilt is absolutely beautiful. What a lot of work, and what an heirloom!! Congratulations on finishing it! 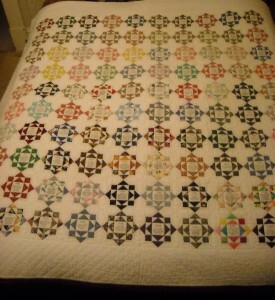 I did do a millenium quilt, but, nothing as intricate and complicated as this! What a beautiful quilt! I love that block. I love your quilt! I remember when you talked about working on it, but I didn’t realize that it was still a UFO. I finished mine back in 2000. 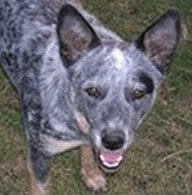 You helped me finish the piecing when you brought me a beautiful piece of fabric that was perfect for the center. Mine has 2000 different fabrics, each one inch square. A lot of them were from my childhood and youth and grandmothers. You achieved far more than I even dreamed for my Y2K quilt. I had lots of fun sending my squishy enveloped and receiving many back from all over the U.S. and other parts of the world. What did you do with the siggy pieces? I plan to put those in the center of whatever block design I finally decide to use. I plan to keep the fabric squares sent with the siggy in the same block. I love your millennium quilt! I was busy navigating motherhood and lucky to find a few minutes here or there to fondle fabric! I just love your choice of block and the fabrics you used–as well as what it looks like now that it’s finished. This is an awesome quilt. I am going to try to make this year a year of finishing up old UFO’s or maybe, in some cases, passing them on for someone else to finish. This is a beautiful quilt. Glad you finished it. Shelly, I meant Shelly! I was thinking about a friend and my wires got crossed. Sorry! 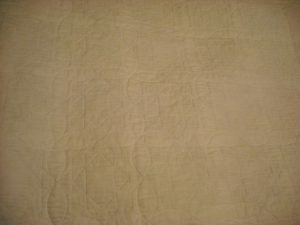 I didn’t start quilting until the latter part of 2007, so I missed all that. I absolutely love your quilt!!!!!!!! I love the pattern you used and all the history it contains. I am in awe. I want to see it in person when I come to visit. That is awesome! Oh my word! What a treasure THAT is! I love it! I mean that is the coolest quilt EVER! I’m so excited that you are finishing it! This is like the coolest quilt, ever! 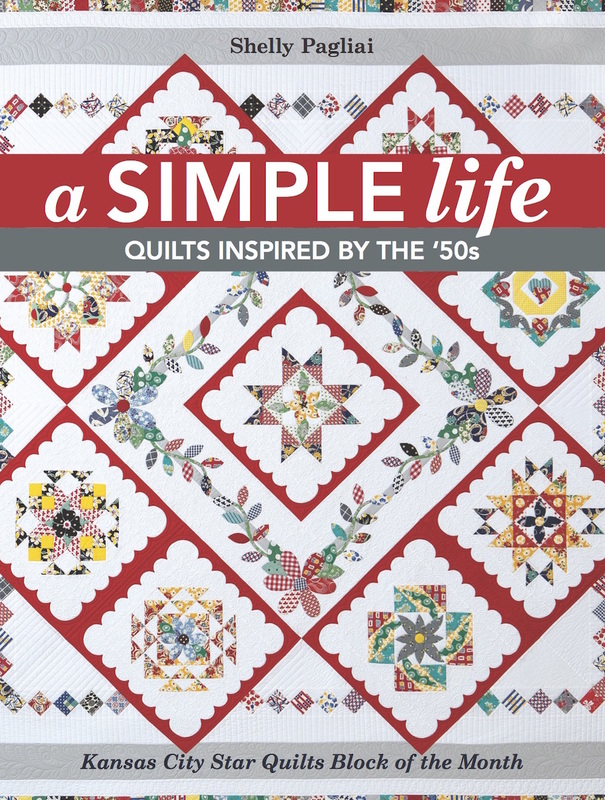 I love the design, the fun facts, the wonderful fabrics, that it sat for 12 years before you quilted it, and your quilting. Wow. What a treasure! I love it, Shelly! Oh my goodness, Shelly. Your quilt is just amazing!! !I wish I could see this one in person…I imagine I could spend hours with it. Beautiful job quilting it!! Wonderful quilt! What a great idea. 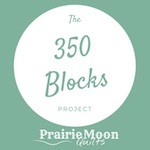 Would love to find out the name of the block. Thanks for sharing. I still remember you making this quilt and making my spiral quilt that is now just a memory. 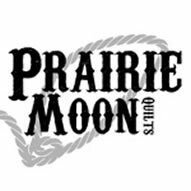 We had so much quilting and other fun together back in 1999 -2000.